If you’re on vacation in California, it’s worth the splurge. The cannagar market is getting more competitive. 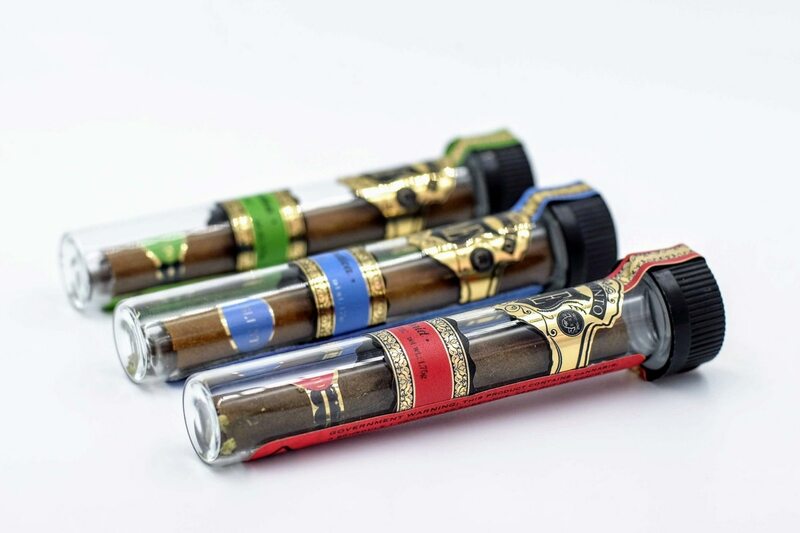 Albert Einstone's, a Los Angeles seed-to-sale cannabis company, is dipping its toe into the broadening pool of cannabis cigars with its new El Blunto line. The glass-tipped, 1.75-gram pre-roll is available only in the Golden State in seven popular strains of high-quality cannabis, including Blue Dream, Girl Scout Cookies and Sour Diesel, each wrapped in hemp leaves by master cannabis cigar makers. The cigar comes in a screw-top glass vial, nice enough for gifting and sturdy enough to throw in a pocket or handbag. When I first started exploring recreational cannabis cigars, I paid $75 for a 4-gram Leira Cannarillo—which makes the $30 price tag on El Blunto feel like a downright bargain. And though it only gives you 20 minutes of burn time, the fact that you could grab two for less than the price of one Leira makes the El Blunto a better buy right out the gate. But how does it smoke? If we're being pot pedants, the El Blunto, as its name suggests, is more of a blunt than a true cigar. A cigar features material molded around a core, cured for some time and then removed to reveal a hollow center. A blunt is a more rudimentary fabrication of cannabis, stuffed into a cigar wrapper and sealed, generally with copious help from the assembler's tongue. Cigar construction may work well for tobacco smoke that's being tasted rather than inhaled, but the hollow center is an inconvenient and uncomfortable feature when it comes to cannabis inhalation. The lack of resistance tends to result in a mouthful of extra-hot smoke—an issue El Blunto has solved with both the glass tip and the traditional blunt construction. The blunt itself was well-rolled and, thanks to the tip, had a satisfying heft in my hand, which made it seem less prone to droppage as we passed it around. And unlike most homemade blunts I've had in my life, this one stayed lit the entire 20 minutes. The smoke started smooth but grew harsher over time, as most rolled cannabis does. I'm a daily toker and coughed a few times during the session but found the flower aromatic and tasty—I also enjoyed the Black & Mild-like flavor of the cannabis wrap. I'd chosen Banana OG to enhance scary movie night. I figured a mellow indica would keep my anxiety at bay and maximize my enjoyment—or give me the great gift of a couch nap, also an acceptable outcome. The movie started at 9:15 and was off to a bit of a slow start, but the blunt helped keep my eyelids up for those first 20 minutes. As the movie droned on, my companion's snores did as well. The Banana OG—aided by the lack of onscreen action—had knocked him out flat. I made it to the end of the 80-minute runtime but was relieved when the credits finally rolled so I could give into the weight of my now-heavy eyelids. We zonked out on the couch for a good hour and a half, and even when the conscious decision was made to vacate the area, it took a while to persuade my body to cooperate. I haven't been impressed with true cannagars, due to the experience and price. Spending close to $100 to smoke 4 grams of weed is unnecessary, even if it does last an hour—you could buy four top-tier pre-rolls for half that. El Blunto isn't a novel idea, but its improvements on both the blunt and the cannagar make it the most appealing luxury smoking experience I've tried yet, and the comparable affordability only adds to its appeal. Thirty dollars is still on the spendy side for what is ultimately less than 2 grams of cannabis, so El Blunto probably won't replace your usual pre-roll purchases. But if you're on vacation in California, it's worth the splurge.